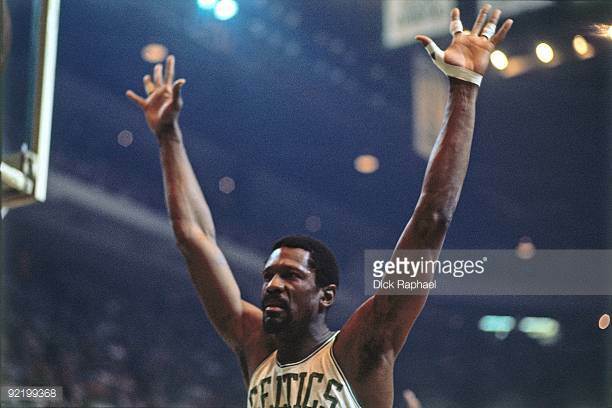 “Sustained Excellence” is a periodic series looking back at the 50th anniversary of Bill Russell’s coaching debut season, and at the Celtic dynasty in general. Check out Part 1 and Part 2 if you haven't had the chance. The Boston Celtics’ 1967-68 exhibition schedule took the team through Louisiana, and the coach’s grandfather got to see him play pro ball for the first time. The older gentleman, a child of the Jim Crow South, was moved to tears by the camaraderie of his grandson’s team. Folks, Banners 10 and 11 might just have been won when ol’ Pops got misty gazing into a shower stall at Sam Jones and John Havlicek. The C’s itinerary that fall took them from the Delta to Puerto Rico … ‘twas there that Bill Russell transposed himself into the kind of leader his team needed him to be. All it took was for him to yield. During the Caribbean hiatus, Russell summoned to his hotel room the squad’s veteran core: Jones, Havlicek, Satch Sanders, Larry Siegfried, Bailey Howell, Don Nelson and Wayne Embry. Coach pointed out that, according to his abacus, there was in that room well over a century’s worth of basketball knowledge and experience, plenty enough for them to again be champions. He acknowledged that he’d been remiss in not making better use of it, particularly in matters of game management. He demanded that they get on him when his own effort lagged. A true sense of shared purpose and accountability emerged from that hotel room. And that island evening would pay dividends in about six months during THE most bizarre playoff series in the league’s 70 years – and right in the middle of a national tragedy. In its seven decades, the league has seen 126 post-season series play out to a full seven games. On only four occasions have both teams won three consecutive games. On only four occasions has the advancing team managed to win but one of its home games. Russ’s ’68 crew finds itself on both lists courtesy of its fourth consecutive Eastern Division Final with Philly. Both Division Final series were scheduled to get underway on Friday, April 5. But the evening before, the country was jolted into a wide array of emotional reaction by the assassination of Rev. Martin Luther King, Jr. The 76ers had scheduled no practice or other team activity for Friday. Each player, alone with his own thoughts, was left to ponder if the game would or even should be played. Chamberlain phoned General Manager Jack Ramsay in regard to the status of the game and was informed there were no plans for a postponement. The Celtics were booked to fly to Philadelphia that afternoon. Auerbach and Russell called the players together for a meeting before trekking to Logan Airport. Some questioned the propriety of playing the game; others (like Southern boy Howell, still in quest of his first championship) were more gung-ho to play. They were in general agreement that a decision not to play might tend to incite further street violence, so they resolved to fly to Philly with the intention of playing ball that night. When all had gathered at Philadelphia’s brand-spankin’-new Spectrum, the players from both teams convened. Several Sixers remained opposed to playing, and the discourse among the players ruffled a feather or two. Finally, less than an hour before tip-off, the 76er players voted, though not unanimously, to take the floor. Their lackluster effort was unsurprising. A national period of mourning ensued through Dr. King’s funeral, which was attended by both Russell and Chamberlain. The series resumed Wednesday, and the teams would twice be required to play on consecutive dates over the next six games. The Wilt Gang regrouped sufficiently to run off their three straight wins. But they were pretty banged up, too. So when Philly left the door open by letting Game 5 at home get away, Boston’s desperation grew to hope and then to ultimate victory – especially when Wilt attempted just one second half field goal (he missed) in what would be his final game for his hometown team. Coach Hannum assumed responsibility for the series loss. He and Ramsay, unlike Russell and Auerbach, had been dogmatic – much as Bill had been as a rookie coach – in a crisis that required a personal touch. Hannum always believed his misjudgment cost the better team a series sweep. The core of this 76er squad was poised to “steal” Game 7 from Boston in 1965. And for each of the next three seasons, Philadelphia was the league’s elite, posting the best regular-season record. No rinky-dink coach could have de-railed such a collection of talent. There was one aspect of Russell's coaching style that Red never felt comfortable with -- he had the same criticism of Heinsohn. Auerbach was a great admirer of legendary New York Yankee manager Joe McCarthy, studied and tried to emulate his ways. McCarthy enforced a strict dress code with his players for all team travel and functions, insisted that they carry themselves like champions. DiMaggio was the paragon, in Red's view. He was open in his criticism of both Bill and Tommy in this regard, went out of his way to praise a guy like Dave Cowens who, for all his laid-back eccentricity, bought into Red's "mystique" hook, line and sinker. No wonder the Boss turned to Big Red when things were going to hell in a hand basket back in the '70's. An index for “Sustained Excellence” is available here.